When I hear the words "comfort food," some of the first thoughts that come to mind are "macaroni and cheese" and "fried chicken." With that said, I didn't grow up in a macaroni and cheese or fried chicken household. My family is Armenian, and I grew up introduced mostly to Middle Eastern dishes, but also to some American favorites as well, just on a much smaller scope. My family never fried chicken, ever. 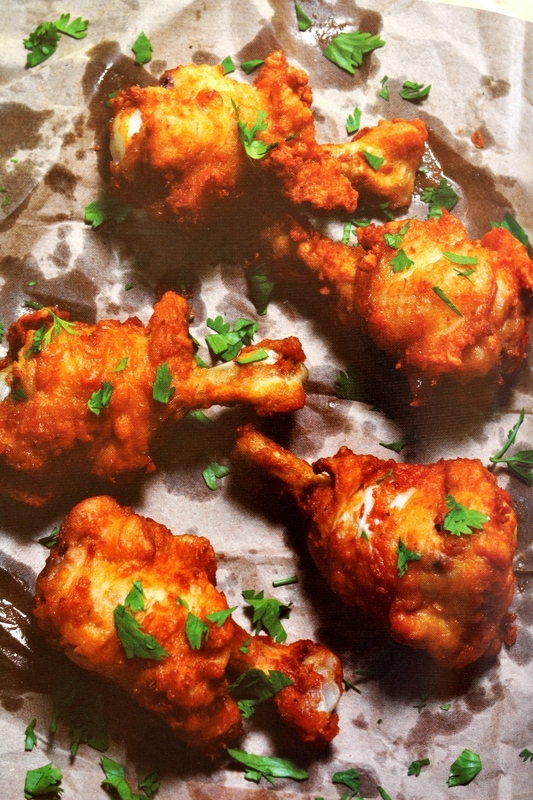 My earliest understanding of fried chicken came in the form of KFC, and even Popeye's. There's definitely better fried chicken in the universe than what is found at these chains. I've had fried chicken at some much nicer Southern restaurants, and I've made it myself. Even though it's not something I really grew up with, I still associate it with decadence and comfort. While fried chicken is a staple on many Southern tables, for me it's a treat! 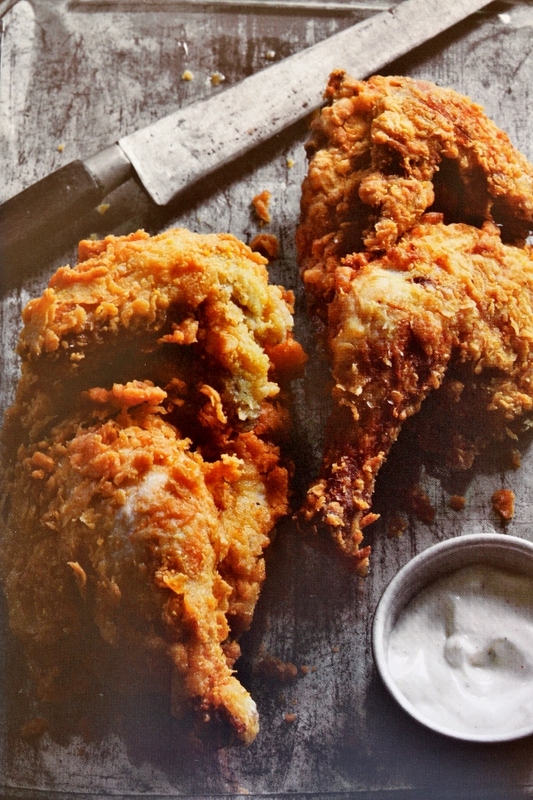 I've had the privilege to review Rebecca Lang's new cookbook entitled Fried Chicken. Before I even opened the book, my first thought was, "Really? 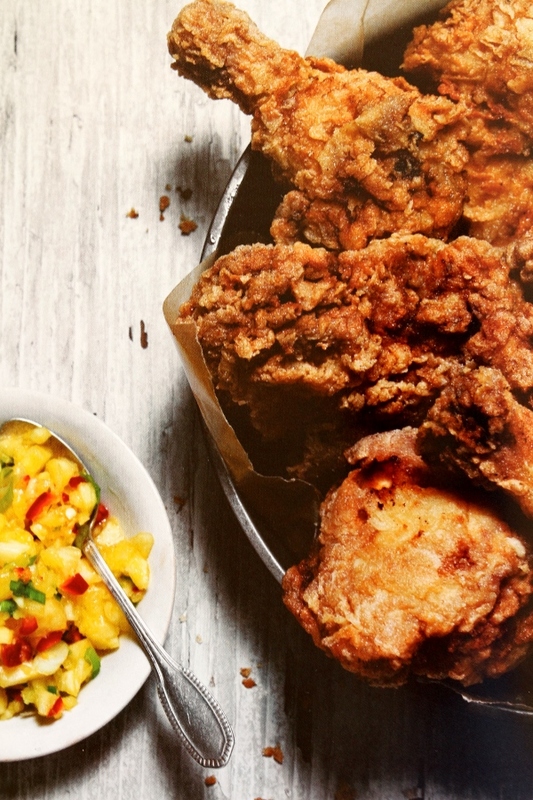 An entire book devoted to fried chicken? How many kinds of fried chicken can there possibly be?" Well, my friends, the answer is A LOT. 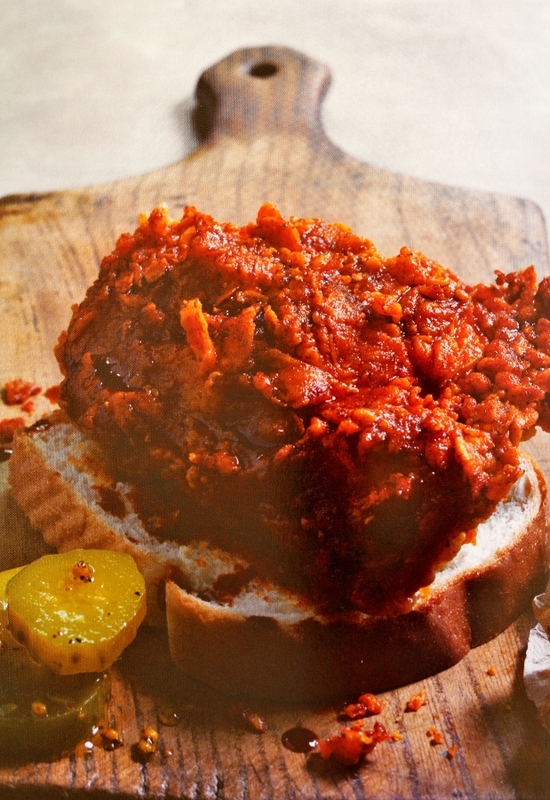 I assumed that the book would feature a million different versions of a standard, Southern fried chicken. I assumed wrong! 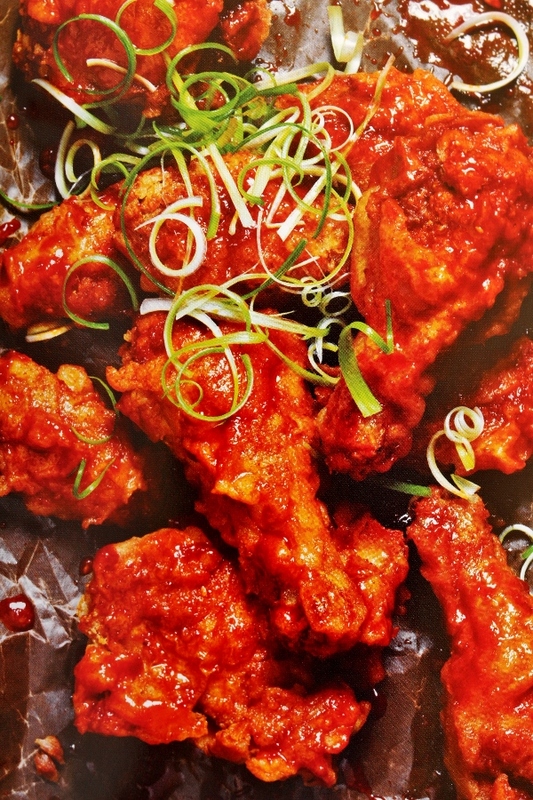 There are recipes within the book for Guatemalan Pollo, Chicken Kara-age (Japanese), Indian Fried Chicken with Cumin Yogurt, Mexican Lime Fried Chicken Tacos, Homemade Orange Chicken (Chinese), Brazilian Fried Chicken, Korean-Style Fried Chicken with Gochujang Sauce, and so much more! I'd say about a third of the recipes are internationally inspired. 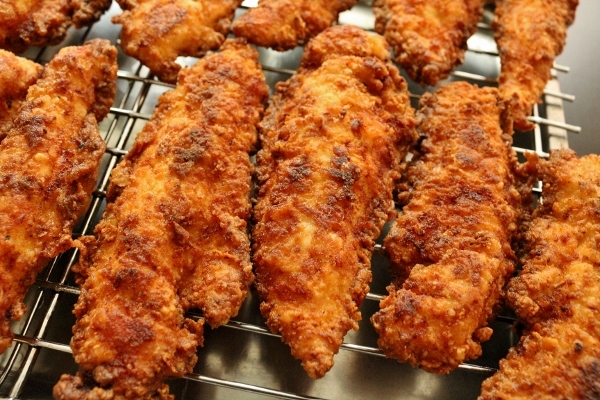 Even the more "typical" non-global recipes still have a huge range from Sweet Tea-Brined Fried Chicken, to Cornmeal-Crusted Chicken with White Barbecue Sauce, Honeyed Fried Chicken with Hot Honey Sauce and Biscuits, Pineapple Chicken with Pineapple Salsa, Tangy Fried Chicken with Dijon, and Tennessee Hot Chicken among many others. The book includes a wonderful introduction discussing how to select the perfect chicken and how to butcher it, an overview of fats and their smoking points, as well as tools and techniques for skillet fried and deep fried methods, both of which are highlighted in the book in addition to combination fried, which uses frying as well as an additional cooking technique to yield the final result. Lang doesn't promote saving used oil for frying at a later date, but I can't really support being that wasteful (unless you're frying fish, of course, and then definitely don't use that oil for frying anything other than fish). I understand the reason--reusing oil lowers its stability and smoke point (although I typically use canola or vegetable oil, both of which already have high smoke points at 468 and 450 degrees F respectively), but even restaurants reuse their oil before emptying their fryers and replacing with fresh oil. Use your judgement, but I like to strain and store used oil in a jar and then top it off with fresh oil when I need to fry something else in the future, and then after I've used in twice or thrice, I will safely discard it. Lang also suggests draining your fried birds on racks to maintain their crisp crusts (with her second choice being draining on paper bags). Normally I use paper towels, which are fine at absorbing grease, but then the fried food sits on the greasy paper towels and is still in constant contact with the fat (kind of defeats the purpose of "draining" it). It's something I never thought too much about, but now I know what I'll be doing in the future! Now, I mentioned earlier that fried chicken for my family and me is considered a treat. 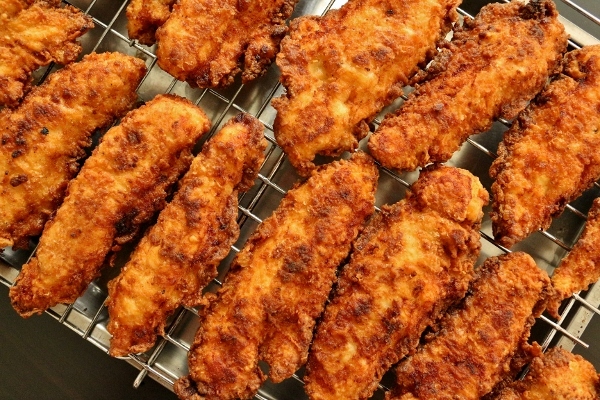 I try not to fry food regularly, but every once in a while a splurge is in order, and crispy, juicy fried chicken is a pretty delicious way to cheat on our collective diets. Sadly for my "diet," I suddenly want more fried chicken than ever before! 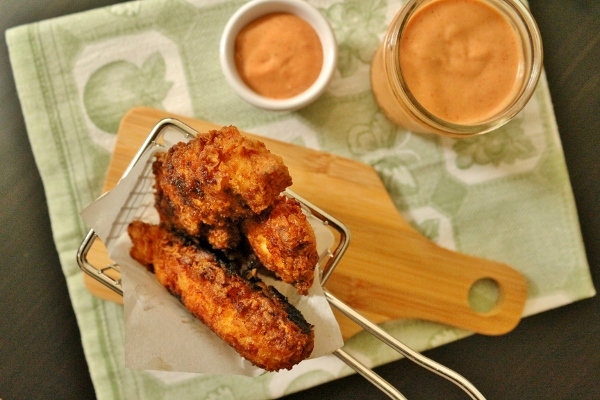 With so many awesome-sounding fried chicken recipes, it was nearly impossible to select just one to start with. Many of the Southern style ones feature really intriguing and new-to-me accompaniments, such as white barbecue sauce from North Alabama, comeback sauce from Mississippi, tomato gravy (Southern, but not sure in which specific state it originates), cream gravy, and many more. 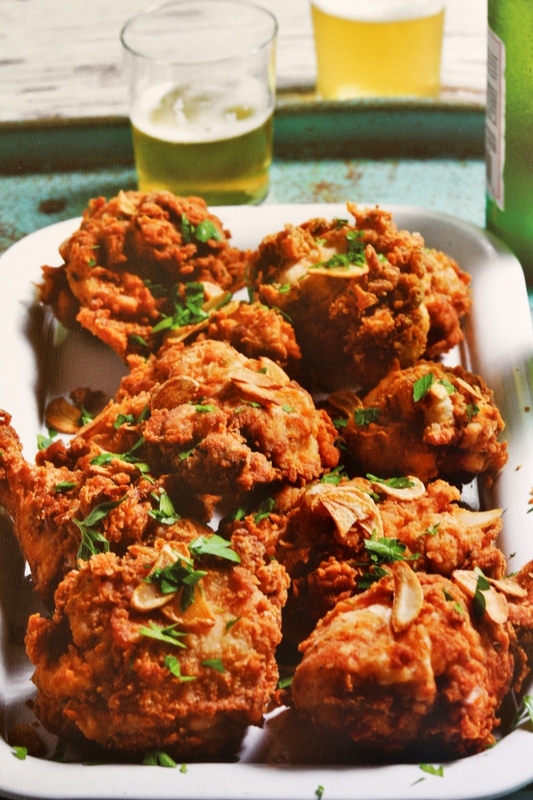 You can definitely mix and match some of these embellishments or follow recipes exactly as they're written, but either scenario will result in some damn tasty fried chicken! 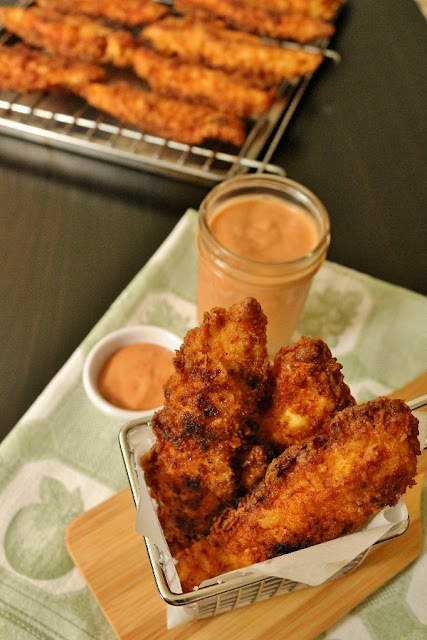 Although I have a steady "to do list" including so many fun fried chicken variations from this book, the first one out of the gate in my own kitchen is Camden's Favorite Chicken Fingers, mainly because I actually had chicken fingers in my freezer, and also the comeback sauce had me seriously intrigued. 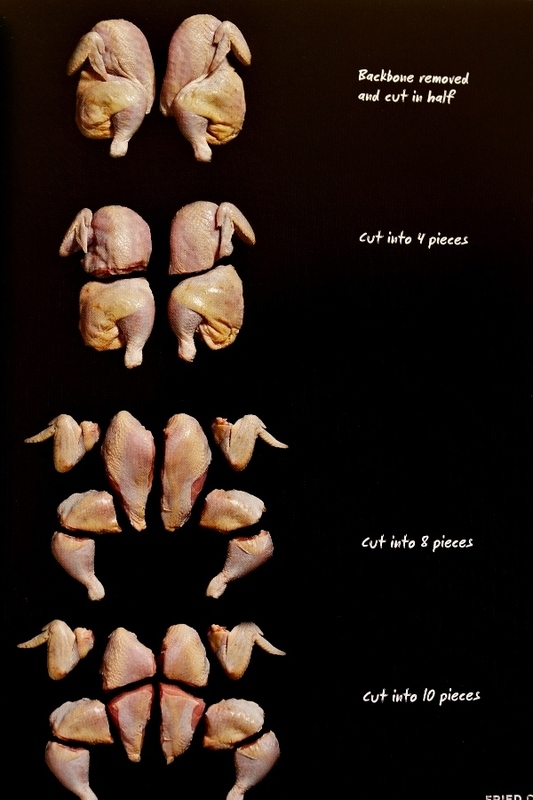 These fingers require less oil for frying as well, since they are smaller than bone-in chicken pieces. 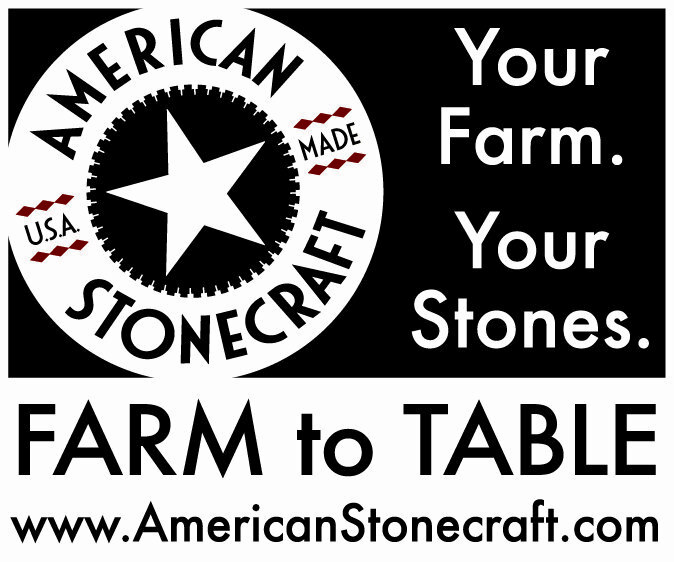 They also don't require you to do any advance prep work, like brining, so they are excellent for weeknight meals as well! 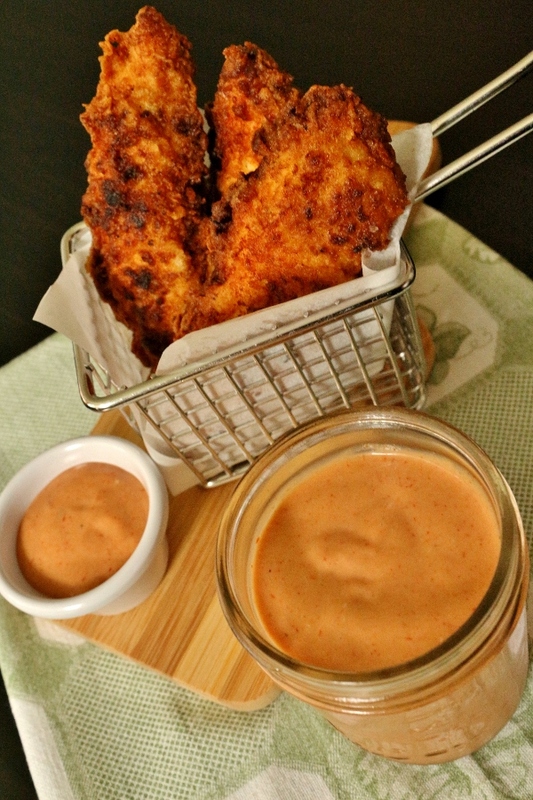 You can easily make these fantastic chicken fingers on a whim, although I highly recommend making the comeback sauce. 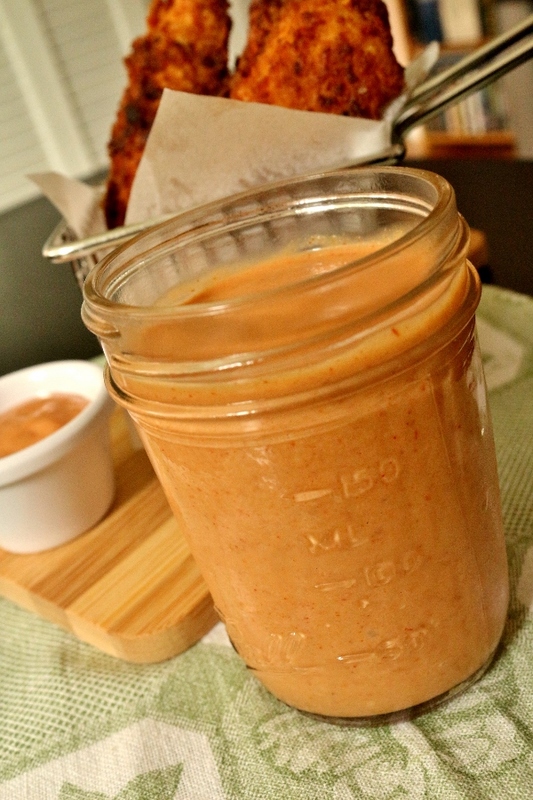 I didn't try the homemade honey mustard recipe myself (yet), but the comeback sauce was one of our favorite parts of the meal. 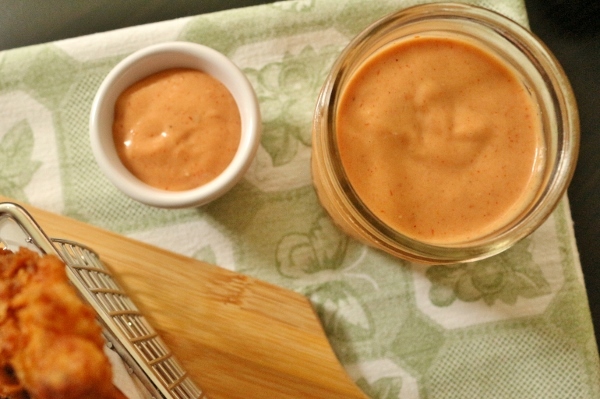 It's an excellent all-around fry sauce, which you can also use for dipping your fries, onion rings, and so much more. I've read that it can also be used as a dressing, though I haven't tried that myself. The comeback sauce is creamy and delicious with a bit of tartness from the fresh lemon juice, and a bit of heat and complexity from a variety of spices. The only ingredient I didn't already have in my pantry or refrigerator was the chili sauce, but it was easy enough to pick up at my local supermarket. It's different than a typical "chili" sauce--it's not Tabasco or Frank's Red Hot, but rather a ketchup-like sauce with extra seasonings and spices. I loved the comeback sauce so much, that I will definitely be making more, and putting my new stash of chili sauce to good use. The main event is definitely the chicken fingers. They are quickly soaked in buttermilk and then dredged in a mixture of flour, bread crumbs, and seasonings. It's a very basic recipe, but the results are fantastic. The only challenge is maintaining the oil temperature. I have a deep-fry thermometer, but the oil in my cast iron skillet wasn't deep enough for the thermometer to reach when I clipped it onto the edge of the pan, so I just held the thermometer manually with my hand to check the temperature periodically when first heating the oil, and during batches. My oil temperature did fluctuate (as it tends to do, and especially since I was juggling holding the thermometer with breading and flipping chicken fingers) but I did my best to adjust my burner accordingly when necessary. In the end, my chicken fingers were a complete success! They were crunchy and flavorful, although some of the coating did start to soften as they cooled on the rack. You can easily keep them warm in a low oven (on the rack) while you finish frying your remaining batches of chicken fingers. This should help them stay crispy throughout the entire process. I will definitely be making these chicken fingers again (and the comeback sauce too, of course), and I can't wait to try some of the other fried chicken recipes in the book! 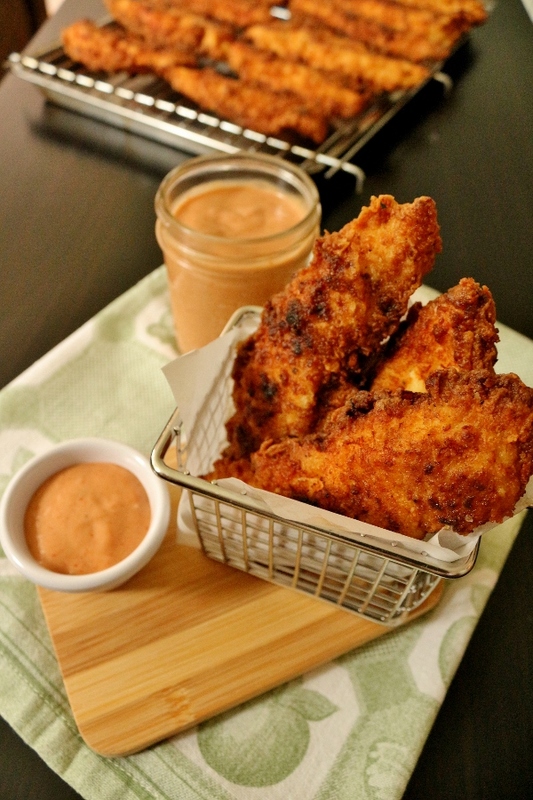 Between the traditional Southern style versions and the International ones, there are great fried chicken recipes for everyone. 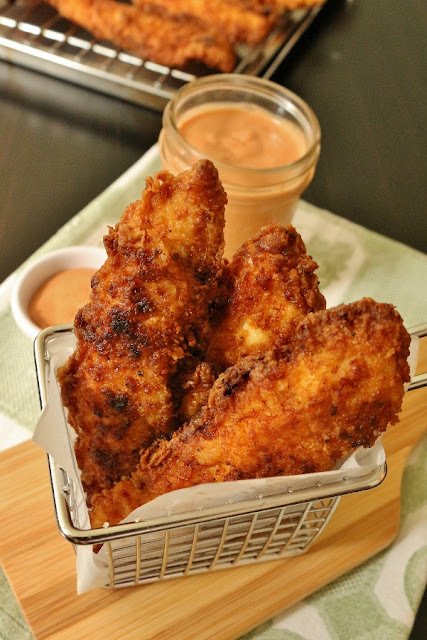 With the Fourth of July only days away, I highly recommend these easy to make chicken fingers if you're planning on hosting friends and family. They are popular with adults and children alike. 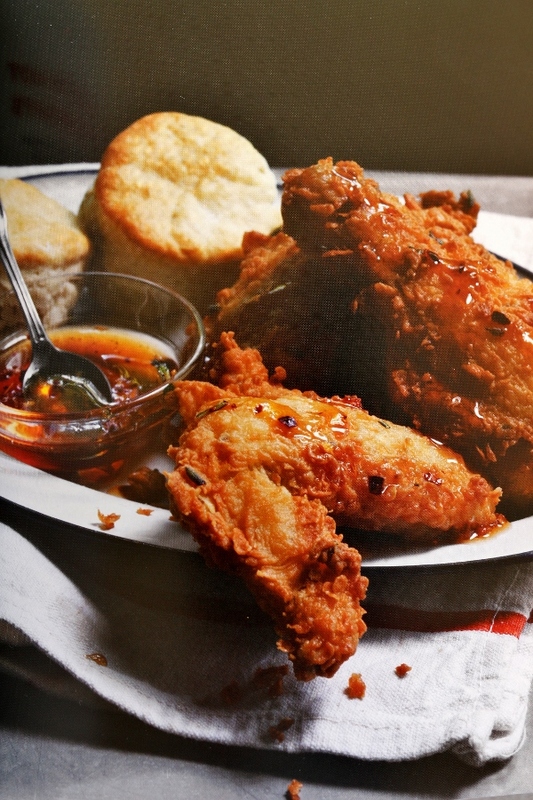 And really, what's more American than fried chicken? In a bowl, whisk together the flour, bread crumbs, salt, and pepper. Pour the buttermilk into another bowl. In a large heavy skillet, heat 1/2 inch of olive oil over medium heat to 325°F. Set a wire rack over a rimmed baking sheet. Working with half of the chicken tenders at a time, dip them in the buttermilk and dredge in the flour mixture (I actually just dumped all the chicken tenders in the bowl of buttermilk and let them hang out in there until I was ready to bread each one). Stir the flour mixture often to keep the bread crumbs from settling to the bottom of the bowl. Carefully place the tenders in the hot oil. Fry, turning often, for 8 to 10 minutes, or until golden brown and juices run clear. Maintain an oil temperature of 315°F to 325°F. Drain the pieces on the wire rack. Repeat with the remaining chicken. 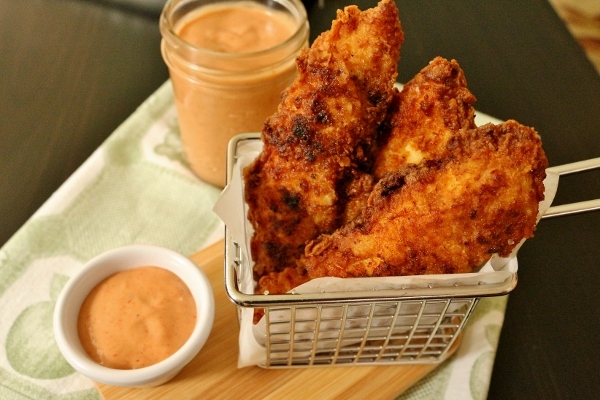 Serve the chicken fingers with honey mustard and sauce. In a small bowl, whisk together all the ingredients. Cover and store in the refrigerator for up to 1 week.